Features a 3-piece hexagonal support rod, top safety hook rod for holding one or two motors and the MABC-2 that screws to top or side of bench. The rod height can be adjusted with the locking screw built onto the base mount. 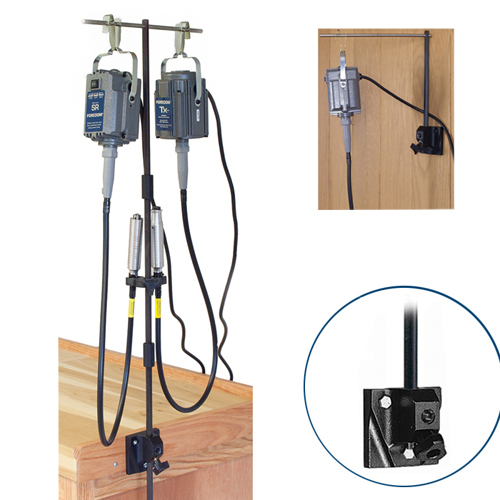 Comes with a Handpiece Rest that slides onto the hanger pole and secures your handpieces when not in use. Also has 2 Spring Safety Clips that slide over the motor bale and on to the hanger rod to keep the motor(s) from jumping and twisting during start up and acceleration. Note that this model can be wall mounted by using the top hexagonal support rod and adjusting the top safety hook rod to hold a single motor. The Handpiece Rest will not work when the hanger is mounted on the wall.